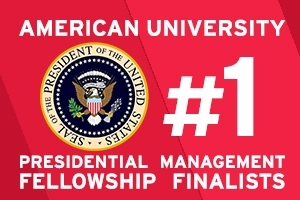 American University, for the second year in row, finished first in the federal government’s Presidential Management Fellowship Program with 42 finalists, including 25 students and alumni from The School of International Service. AU outpaced George Washington University, Georgetown, Johns Hopkins, and the University of Maryland. AU succeeded, despite a 32-percent decline in the overall number of candidates nationwide, from 1,200 to 808. Presidential Management Fellows receive 160 hours of intensive management and leadership training at one or more federal agencies, fulfill a four to six-month developmental assignment, undergo regular evaluation and assessments, and are eligible for conversion to a full-time or term position upon the successful completion of the program. The fellowship was established in 1977 by President Jimmy Carter. Here is a PDF list of the PMF finalists this year. Congratulations to all!